Join Farm Sanctuary as we look back at the miracles you made happen this past year by putting compassion first for farm animals. As 2015 draws to a close, we are reminded that every farm animal is special and deserves a life free from cruelty and abuse. Thank you for helping Farm Sanctuary be the rescuer, caregiver, and advocate farm animals desperately need. A compassionate world begins with you! I had no idea what to expect. I was in Massachusetts, sent by Farm Sanctuary to collect signatures. The thought of going up to complete strangers and asking them for their support seemed rather nerve-wracking. Stepping outside my comfort zone and doing it anyway, however, led me to quickly realize just how rewarding campaigning and gathering signatures is, especially if done in the name of something you truly believe in. The author with a compassionate signer! Whether it was outside the local grocery store or walking on campus, most people have had some sort of encounter with signature-gatherers. The reactions of those walking by are always mixed: Some hurriedly say no, while others ignore. And then there are those who stop to learn more. Though signatures are our goal, I know our mere presence is making a sizable difference in the public’s awareness – even among those who walk right on by. If, just for a second, I allowed them see something they had never seen or thought twice about before, that is success. For all I know, they could have looked up our efforts online later that day and spread the word during dinner. These types of reminders are important to keep in mind, especially when one finds the job exhausting or when the number of failed attempts to reach people becomes discouraging. The best and most reassuring reminder of all: why you’re standing there and who you’re standing up for. For me, other Farm Sanctuary volunteers, and the many others involved in this particular campaign, it’s the animals on factory farms in Massachusetts suffering every day from cruel and inhumane confinement practices. 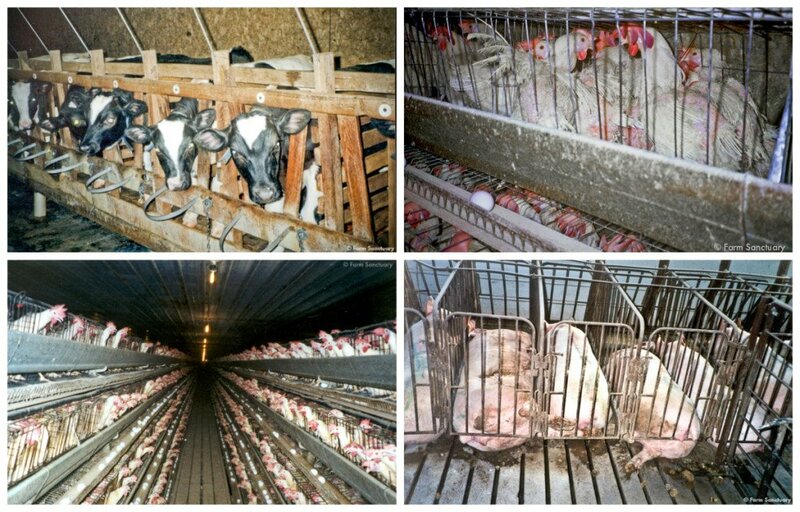 As part of the Citizens for Farm Animal Protection – a broad coalition of non-profit organizations, farmers and businesses, community leaders, and grassroots activists – we are working to enact a ballot measure in Massachusetts that will ban three of the most cruel and inhumane confinement practices used on factory farms: veal crates, gestation crates, and battery cages. A concerned Massachusetts resident signs the petition! All those offering their signatures and spreading the word are helping us make sure calves are no longer taken from their mothers and placed in crates designed to keep them deprived and immobilized for the remainder of their lives. Everyone signing is helping to protect pigs, highly intelligent creatures who need a certain level of mental stimulation (like humans), from being subjected to gestation crates built only about two feet wide. And of course, citizens’ support is also helping us ban battery cages and protect hens from being crammed, five or more hens to a single cage, with dimensions that allow each animal less space than the size of a standard piece of paper. If this law is passed, Massachusetts will join ten other U.S. states that have already passed laws to address these kinds of inhumane practices. The opportunity to save these animals from horrible suffering makes all the hard work involved in campaigning more than worth it. At the end of the day, all I have to do is remember how many animals are depending on me to be their voice and end their suffering. And this is what has and will continue to keep me going, one signature at a time. Thanks to the efforts of Dallas and hundreds of others, the Coalition was successful in gathering all the required signatures in the first portion of the ballot initiative process. Stay tuned for updates! 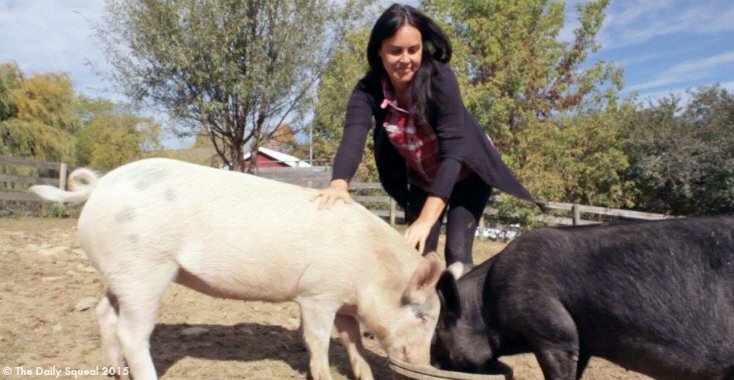 Want to intern to help farm animals? Learn about Farm Sanctuary’s internship program. I turned around and Sonny was there. I was having a really sad day. I decided to walk up the hill to find my best pal, a steer named Sonny. For five minutes straight, I just hugged him, wetting his neck with possibly a gallon of tears. Knowing I had to get back to work, I finally parted with him and walked down the hill toward the shelter buildings. After a while, I heard a noise and turned. Sonny had left the herd and followed me. He knew I needed him, so he was there. Just like us, animals need to feel that they are not alone. During my two decades in animal sheltering, I have witnessed the power of family and friendship every single day. All creatures have a will to live, and friendship motivates them to live their best, supported by and supporting others. Here are my favorite examples from the past year. Louise, Tracey, Hazelton, Reubie, and Summer enjoying a beautiful day at sanctuary. In February, three lambs were born at our New York Shelter. Far along in their pregnancies when they were rescued from neglect, mamas Tracey and Louise (Tracey’s daughter) faced high-risk deliveries, but with the help of devoted shelter staff, everyone made it through. Tracey, who delivered son Hazelton first, supported Louise during the birth of twins Reubie and Summer, calling out to the younger ewe throughout her labor. Tracey also nursed Summer when Louise couldn’t produce enough milk for both twins. As dairy sheep, Tracey and Louise endured repeated impregnation. Though Tracey was allowed to keep Louise, all of her sons were likely taken away to be sold for slaughter. Hazelton was the first son she was allowed to keep, and she wasn’t about to let anything happen to him. When we introduced the group to our main flock, Tracey immediately began putting everyone in their place, head-butting even the largest males, so all knew that her family was not to be bothered. Sheep express affection and devotion primarily through physical closeness, which is why you’ll find this family sticking together and sleeping side-by-side at night. For Tracey and her clan, sanctuary means being together. Levi was found loose in NYC after escaping from a storefront slaughterhouse. During his first weeks at sanctuary, he stayed indoors sitting on a hay bale. We feared this behavior arose from health issues, but it turned out that Levi, who had likely witnessed the slaughter of his herd mates, was simply too terrified to do much of anything. Though we approached him with gentleness and care, he could not trust us. That all changed when he met Romy, a lamb who came to us from a small farm where he was found alone and dying in the cold rain. When Romy was finally well enough to go outside into his yard, Levi couldn’t help coming out into his own adjacent yard to investigate. Within hours, the little goat who had been paralyzed by fear was running, jumping, and kicking up his heels as he played with his new best friend. Following the lead of gregarious Romy, Levi has become a whole new goat, bravely walking right up to human visitors. His friendship with Romy has transformed him, and his world, once limited to the corner of a hospital pen, has gotten a whole lot bigger. Vince, center, with his best friends Calvin, left, and Paul Harvey. Vince had a rough start in life. Born at a goat dairy — a male kid in an industry that has very little use for males — he was used as partial payment to a tree trimmer. But the tree trimmer didnʼt want him either, and went door-to-door in his neighborhood trying to sell him. Things started to look up for Vince when he was taken in by a kind woman who wanted to protect him, but she soon discovered that her little charge was very sick. She contacted Farm Sanctuary, and we were able to get Vince the care he needed, which included antibiotics, tube feedings, and medication for his pain. Slowly but surely, he began to feel better, and he was finally able to leave the veterinary hospital and come home to our Acton shelter. But goats are herd animals; Vince was lonely as the new and only kid at the shelter. Fortuitously, we learned that a combination goat dairy/sanctuary is phasing out their dairy business to focus on their sheltering work. Though the sanctuary’s operators initially intended to support their sheltering work by selling dairy products from the goats in their care, they eventually realized that this model was not sustainable. Goats, like all other mammals, must be impregnated in order to lactate. That means that goat dairies produce not only milk but also baby goats. The facility had more goats than it could handle. Enter Calvin and Paul Harvey, the best friends Vince could have hoped for! The trio has become a source of endless entertainment for sanctuary guests and staff. One of their favorite games is bouncing off caregivers who are bent over or lying on the ground with them. Buoyed by the friendship they share and the caring people all around them, the kids are keen to explore and experiment. For these best friends, the sanctuary is the best kind of playground. Anna & Maybelle — the best of friends and sweet as can be! Follow their adventures in their new home at The Daily Squeal! Anna and Maybelle had likely fallen off a transport vehicle before they were spotted wandering on a busy roadside. Piglets are notorious for squirming their way out of trailers, and they sometimes fall out onto the road without the driver even noticing (this in addition to the countless piglets and other farm animals who end up on the road when transport vehicles crash or overturn); many of our residents came to us after these accidents. Such incidents can be fatal for the young animals, but Anna and Maybelle were lucky enough to avoid being seriously injured in the fall or getting hit by another vehicle. They also had each other, which was surely a comfort during their two frightening days by the roadside. Right now, these piglets’ lives are all about exploration and fun — and each other. They play and dig and run with utter abandon, and they are always together. When separated for even a few moments, they squeal and run to search for one another. When we watch them romping and rooting, we recognize a common joy in simply being alive. There are so many other beautiful bonds that we’ve seen over the years. It saddens me that the majority of industry-raised animals are deprived of these experiences, but at Farm Sanctuary, we take the time to nurture these ties that mean so much to our animal residents. We recognize that our animal residents share so much in common with us: awareness, intelligence, rich emotional lives. Just like us, they crave companionship, playmates, and a support network — and making sure they have it is a vital part of the Farm Sanctuary life. Joey enjoying pasture time at Farm Sanctuary. 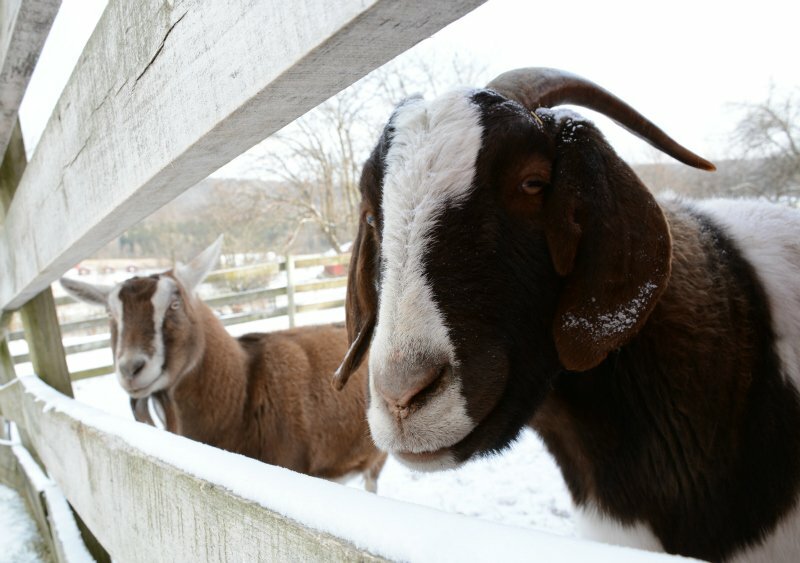 This month we said goodbye to Joey, a goat who had called our New York Shelter home since 2007. If you ever visited the shelter, you probably remember Joey. He was usually one of the first members of his herd to approach guests, and he loved attention. Joey joined the shelter family when he was just six months old. He was found wandering the streets of Brooklyn with a slaughter tag from Texas in his ear, likely having escaped from one of the city’s live markets. These storefront slaughterhouses are notorious for keeping animals in unsafe and terrifying conditions before slaughtering them onsite. Luckily, Joey escaped and found a home where he could be loved without reservation. It took a while, however, for Joey to warm up to us. It’s likely that Joey witnessed the slaughter of other animals, perhaps even family members, before his escape. When he arrived at sanctuary, he was terrified of everyone. We had to place him in a special pen with high walls, so he would not jump out. Even when he finally joined a herd of goats, he was so frightened that, on his first day, he scrambled over a fence and wedged himself behind a fuel tank. Thankfully, he was unharmed. It took about six months for Joey to finally realize that he was among friends and truly safe. That realization transformed Joey. Eventually, he felt so at ease here that when he napped, he really checked out. He was notorious for snoring and groaning as he enjoyed a deep doze. Every time we welcomed a new shelter staffer, intern, or tour guide, we would inevitably get a worried call over the radio about a goat who was “down and making weird sounds.” It was just Joey at peak relaxation. 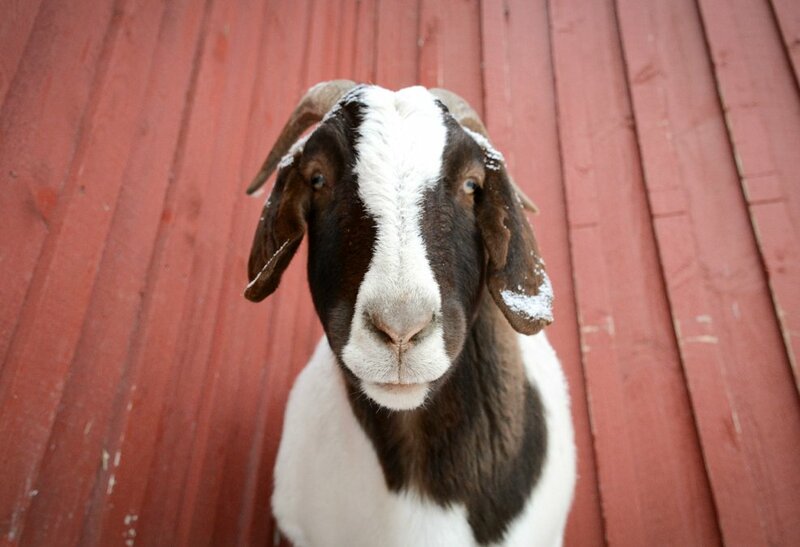 Joey, with his friendly, outgoing personality, was a special favorite of many Farm Sanctuary visitors. 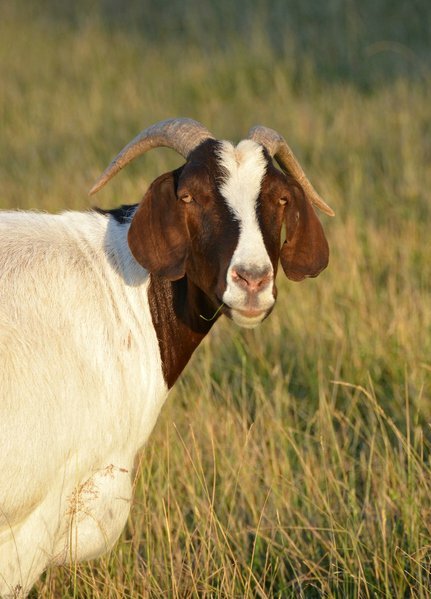 When he was still young, Joey lived with a group of female goats and became utterly smitten with a doe named Cocoa Bean, who was several years his senior (staff joked that he was into older women). The two slept by each other’s sides every night. 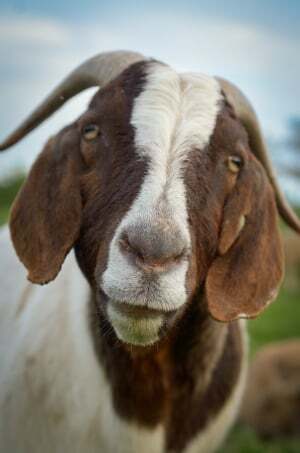 Even when this group was integrated with the sheep flock, which was also home to several goats closer to Joey’s age, Joey remained devoted to Cocoa Bean, staying by her side even as old age slowed her down. In his prime, Joey was huge, one of the biggest goats on the shelter, but he was also gentle. When he first joined the sheep flock, the group was led by Dino, a much smaller goat. We’d placed Dino with the sheep because he was not quite strong enough to contend with the hardier goats in the main herd. Among goats, hierarchy is typically determined through contests of strength, and if Joey had wanted to oust Dino, he could have. But Joey never once made a move on the position, even when Dino was further weakened by geriatric health troubles. Only when Dino passed away did Joey take over the lead. Though he had never felt compelled to fight for leadership, Joey stepped into the role adeptly and became an excellent leader to the herd. When the sheep were on the move, you could count on finding Joey out in front. From a youth spent snuggling with his sweetheart to maturity as head of the heard, Joey experienced the full arc of life at sanctuary before arriving to old age. As Joey aged, he developed a spinal cord condition that caused ataxia, and his hind limbs gave out when he attempted to rise or walk. The condition gradually worsened, and we even attempted to outfit him with a special cart/wheelchair designed for goats. He was no longer able to run at the front of the herd; he had to follow, ever so slowly, behind. Just as he had once supported Cocoa Bean when her pace slowed, Joey now received support from his friend Clarabell. She stayed by his side on the way to pasture in the morning and back to the barn at night, even though it meant a very long, slow journey each way. Joey, front, with his devoted friend Clarabell. Joey met his changing condition with equanimity, and through the help of the cart and other interventions, we were able to keep him comfortable and happy for over a year after his first symptoms emerged. Ultimately, however, Joey’s condition became more severe and spread to the brain, leaving him unable to rise and, on his last day, unaware of his surroundings. Recognizing that we could no longer provide a good quality of life for Joey, we made the difficult decision to say goodbye and helped him pass peacefully through euthanasia. Remembering Joey, we think of those funny noises he made in his sleep. In a way, they were the sounds of sanctuary: total trust, utter peace, sweet surrender to the pleasure of being alive and safe. Joey loved his home, was good to his friends, and looked out for his herd. Life for him was straightforward, simple, and kind, and he too was all of those things. He will be deeply missed. Joey on a brisk winter day at sanctuary. Vegan cheesemonger, chef, cookbook author, and television host Miyoko Schinner has spent the better part of the past three decades promoting delicious, decadent, and healthful plant-based foods. But did you know she’s also a chicken rescuer? 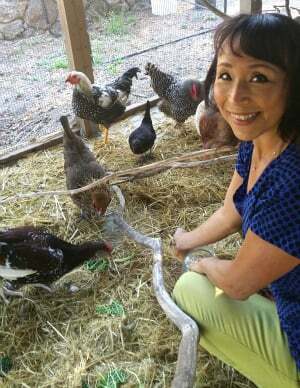 The founder of Miyoko’s Kitchen recently opened her heart and home to two roosters (Satchmo and Bird) and Bessie hen, whom she adopted through Farm Sanctuary’s Farm Animal Adoption Network. Who was the first farm animal you adopted and why? We started adopting hens about six or seven years ago. Our first was Snookie — she’s still around, and is the smartest chicken on the planet. It was actually my husband’s idea to adopt chickens, and he took a chicken class, so we would know what to do. We had the room, and we’ve both always had this little secret desire to surround ourselves with different animals. (I’ve actually fantasized about it.) We’ve rescued chickens from hoarders, factory farms, and so-called “free-range” farms. Until now (we just moved to a farm from the ‘burbs), we were only allowed to have hens, so that determined the species we adopted. We are hoping to adopt larger animals once we get settled into our house, get the barn ready, and learn a bit more about the needs of the different species of individuals we might adopt. What differences and similarities do you see between companion animals and farm animals? I didn’t know before we started adopting chickens how complex their vocabulary was. Since then, I’ve learned the meaning of their different sounds and how they communicate to each other to warn about predators, to announce the laying of an egg, to tell others when they’ve found a tasty treat. We underestimate the ability of farm animals to have language just because it’s different from ours or our companion animals. While many of the chickens we’ve had don’t seem inclined to cuddle up, we have had some individuals (Gloria, Amazing Grace, and others) who follow us around, jump into our laps, want to be stroked. They are as different in personality as any humans or companion animals. We just lump them all together as chickens because most of us don’t have the opportunity to get to know them. What do you see as the long-term implications people should consider when adopting farm animals? I think it’s important to know what you are doing. Different species have different needs, and it’s important to know what you’re getting into! Make sure you have the time, patience, and resources to care for them. I don’t have experience with species other than chickens, so I’m not an expert. But I hope to be! Beyond adopting farm animals in need and making delicious plant-based foods, Schinner also helps animals by giving back to animal protection charities! Miyoko’s Kitchen donates 1% of online sales to a different nonprofit each month (through November, it’s Farm Sanctuary!). In December, the company will double that donation to the nonprofit that receives the most votes in its online poll! Please vote now to help Farm Sanctuary! 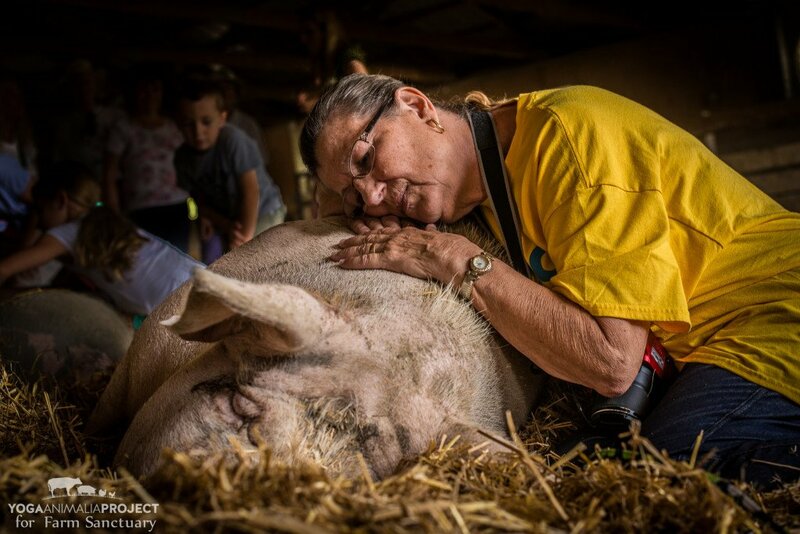 Life doesn’t get much better for a pig than it is for Anna and Maybelle. Their adoptive mom is animal activist and Do Unto Animals author Tracey Stewart. 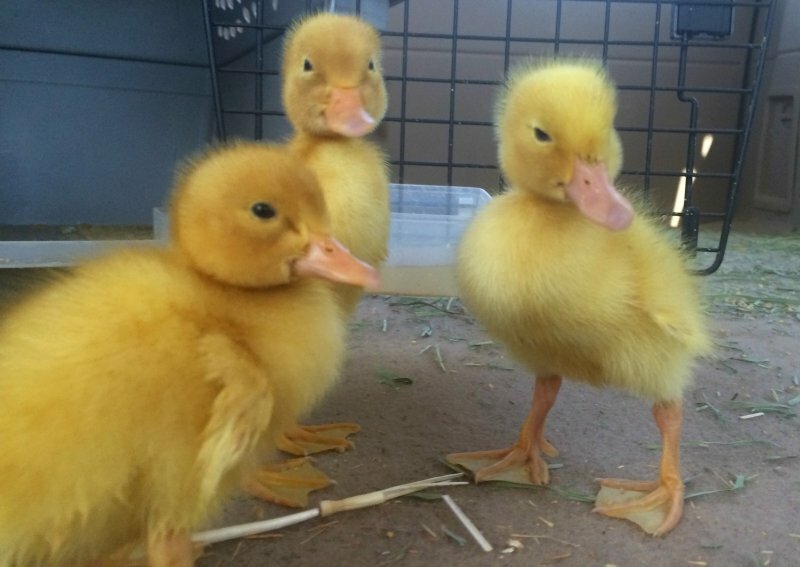 Dad is none other than Jon Stewart, former host of “The Daily Show.” Their new parents make sure they have plenty of fresh straw to nest in, a spacious pasture to run and play, and healthy food to eat — even spoiling them with the occasional treat. Tracey, Jon, and their two children treat Anna and Maybelle like a part of the family — and they are quickly becoming just that. 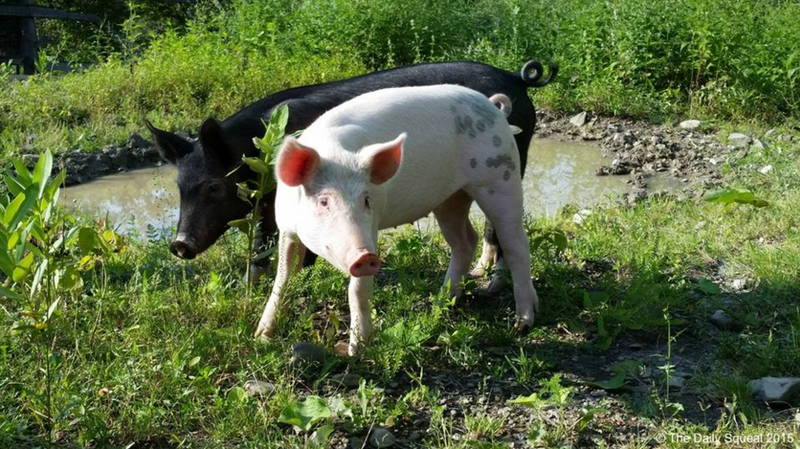 How did two pigs who were just months ago destined for slaughter become part of the Stewart clan? Sit tight, because it was a long journey to this happy ending. When an animal activist named Julie Robertson gazed out of her window while driving a busy road in Georgia, she was certainly not expecting to see two rogue piglets trotting along the highway. But that is exactly what she saw in the summer of 2015, when she first spotted Anna and Maybelle. The piglets were visibly terrified, confused, and exhausted. Anna was limping along with an injured leg, and Maybelle’s infected eye didn’t make their journey any easier. 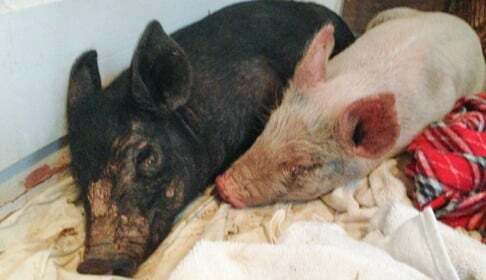 It was clear that these two little pigs needed to get to safety — and fast! Maybelle and Anna shortly after their rescue from a roadside. Anna and Maybelle were so frightened that it took Julie two days to catch them. Eventually, the girls were so hungry that they allowed Julie to coax them into a crate with treats and whisk them to safety. When the pair arrived at her house to a nest made out of blankets. Finally safe, the little pigs were so worn out from their ordeal that they headed straight for the cozy pile and were snoring almost instantly. We can only guess based on past rescues, but we believe Anna and Maybelle fell from a transport truck. Piglets are notorious for squirming their way out of trailers, sometimes falling onto the highway without the driver even noticing. Such a fall can be fatal for young animals, but these two tough girls avoided serious injury, and managed to stay out of oncoming traffic. Most importantly, they managed to stay together, which helped them both survive their scary ordeal. Anna and Maybelle love exploring their world together! If they had remained on the truck, the piglets likely would have been heading to a stockyard, where animals are bought and sold. There, piglets are sold to “finishing operations,” where they are raised until they are just six months old and then sent to slaughter. Fortunately Anna and Maybelle narrowly escaped this sad fate, and now they will live out their lives splashing in puddles, squealing with joy, and rooting like pigs should! When Farm Sanctuary first heard about Anna and Maybelle, we immediately offered them a home at our rescued animal shelter in New York. And that is where they met the Stewarts. Anna and Maybelle’s story captured the hearts of Jon and Tracey upon first meeting while they were on a tour of the sanctuary. And soon they had a place not only in their hearts, but in their home! Tracey with Maybelle and Anna. And now the real journey begins. As they regain their health, Anna and Maybelle’s unique personalities are starting to emerge. The friends, possibly sisters, are closely bonded. The girls take great comfort in each other, just as they have since their frightening two days on the roadside. Each day they are learning to live like piglets: playing, exploring, and even chasing the Stewarts’ two children around the pasture, to everyone’s delight. We can only imagine the bright future and fun that lies ahead for these two pigs lucky enough to be rescued — and by the Stewart family, no less! Everyone who has met Anna and Maybelle is simply squealing with delight as we watch these “PFFs” (pig friends forever) grow into their personalities. Follow Anna and Maybelle’s journey at The Daily Squeal! 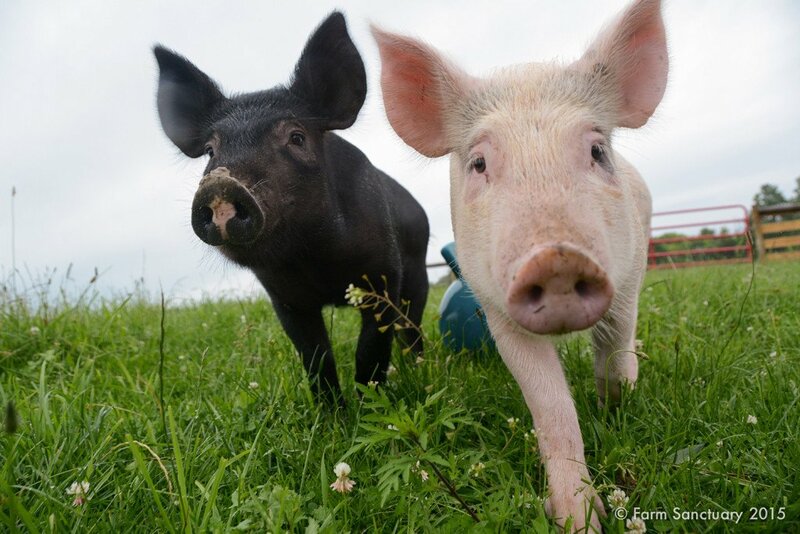 Truffles pig and Denise, who helped rescue her, meet again at Farm Sanctuary. Truffles pig is a testament of the healing power of love. This wonderful pig, a favorite of many Farm Sanctuary visitors, will be ten this year — an incredible feat considering her origins. She was raised to live to just six months of age, by which time she would have been slaughtered for meat. Instead, nearly a decade later, she is the matriarch of her sounder, loved and respected both by her fellow pigs and her human friends at our New York Shelter. During her first few weeks of life, Truffles was removed from her mother and subjected to tail docking without pain relief, both standard procedures on factory farms. Confused and frightened, she was then packed onto a hot and crowded transport truck to travel to a finishing farm, where piglets are fattened for slaughter. Her escape from this fate was fortunate, but not without additional hardships. She fell off of a truck into heavy traffic on Interstate 69 in Indiana, and was bruised and bloody from the fall. 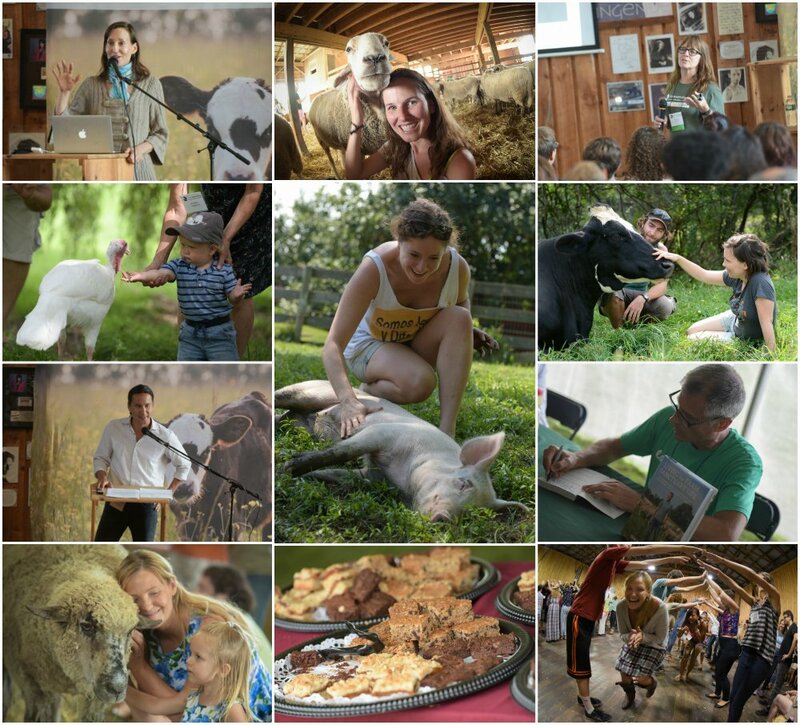 On August 15 and 16, hundreds of animal advocates converged on Farm Sanctuary’s Watkins Glen shelter for our 2015 Hoe Down. The Hoe Down holds an important place in Farm Sanctuary’s nearly 30-year history, and we think this year’s event was our best yet! Our speakers focused on topics ranging from effective advocacy to humane education to the lives of Farm Sanctuary’s rescued residents. A major theme: We’re winning! More and more people are becoming educated about the abuses farm animals face, and many of them are making changes to their diets in response. The change is visible. And the industries that profit from animal abuse know it! 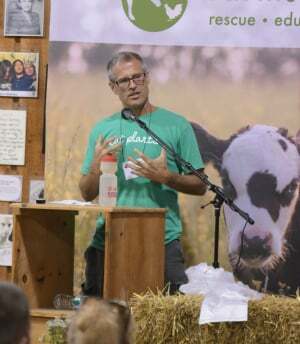 Gene, Farm Sanctuary’s co-founder and president, has been called “the conscience of the food movement” by TIME magazine. For 25 years, he has traveled extensively, campaigning to raise awareness about the abuses inflicted by industrialized factory farming and our cheap food system. His latest book, Living the Farm Sanctuary Life: The Ultimate Guide to Eating Mindfully, Living Longer, and Feeling Better Every Day, delivers five tenets for maintaining and sharing a compassionate, vegan life. His previous best-seller, Farm Sanctuary: Changing Hearts and Minds About Animals and Food, was published in 2008. The first time I saw Alexander was at a central New York stockyard, on a bitterly cold day just before Christmas 2010. There were 300 newborn dairy calves on sale that day. Confused, terrified babies wailed for their mothers, and adult cows called back, all separated and unable to comfort each other. I was hoping for the chance to save a calf who had collapsed on the loading dock before even making it to the auction floor, but I was told I had to wait for the sale to end in case he stood up and could be auctioned off with the others. During the calf sale, the auctioneer offered me a second calf who was so small that no one would bid on him. Then there was another calf, a big guy, who received no bids because he was wobbling, falling down, and rolling his fetlocks. He was offered to me as well. That was Alexander. When we arrived, the hospital staff ran blood work. Lawrence, the calf who had collapsed on the loading dock, was in renal failure. Blitzen, the tiny one, had pneumonia. Alexander, nicknamed Goliath by the staff because he was so large, was septic. His umbilicus had not been properly cleaned, and he had not received enough, or any, of the immunity-boosting colostrum his mother’s milk would have provided. Together, these circumstances resulted in an infection that spread to his left stifle, which is the joint that connects the femur, patella, and tibia. 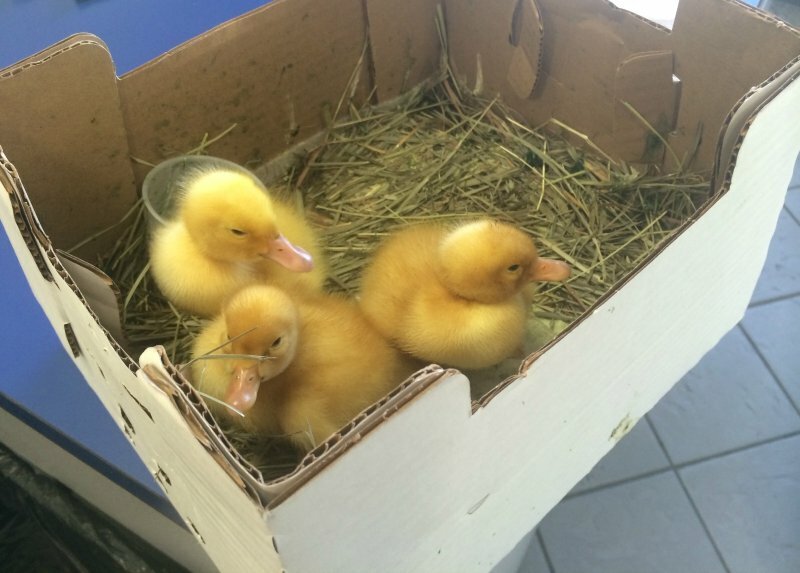 Three ducklings recently rescued by Farm Sanctuary after being purchased from a hatchery and shipped through the mail. For questions or concerns about blog posts or comments, please email us.